Congratulations to Barb Hintze Curtis, our July winner! 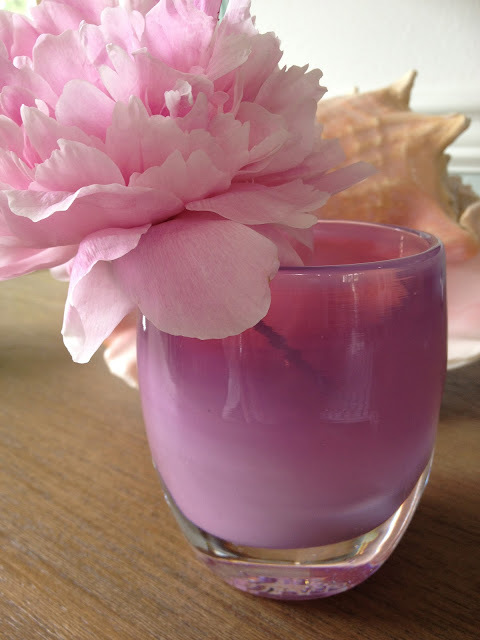 I am the soft iridescent swirly pink inside the shell you found on the beach that summer on Nantucket. I am the much loved whispered silk ear of your childhood stuffed bunny, Sam. I am a blush peony that reminds you of your grandmother's smile when she closed her eyes to inhale the scent. I am the raspberry sorbet glassybaby. One of the things that makes us consistently happy here in the happy girl studio is the glassybaby, whether in aquamarine, sunshine or wet dog, we get blissed out just looking at these artisan-made handmade pieces of art. We use them for candlelight, of course, but we also love them for cut flowers, to hold our hairbands, seashells and even for emma's puppy treats. The glassybaby is the gift we give for a new baby, an engagement or simply as an "i love you" gift. Because it makes us so happy, in today's Monday morning meeting we decided we want to share the happy. So each month through 2012 we will be giving away a favorite glassybaby because we want you to be happy too. To enter to win this month's glassybaby in raspberry sorbet, leave us a comment telling us what you love about July. Is it the vacation at Cape Cod? The way the air conditioning hits you when you come inside from a hot muggy day? Or perhaps it's the fresh produce at the farm stand? Leave your comment by July 31 and we'll select a winner at random on August 3, 2012. The winner's name will be posted here. Here's to a happy, safe July! Want to know about the glassybaby story? Watch this video to see what makes glassybaby so very special. this giveaway is not sponsored by glassybaby. we just love them.